I was most excited by the return of the frogs to my garden pond. They've been breeding there for the last four or five years, and this year have already produced frogspawn! Actually, looking back at my records, they arrived at exactly the same time last year, but a late covering of snow, and a few consecutive icy mornings spoiled the frogspawn. The group consists of about ten frogs in all, with four larger frogs seemingly guarding the frogspawn, while the smaller ones head off to investigate the pond. As a photographer and a nature lover, I find the whole cycle of frog life a fascinating subject to shoot. But the best thing is that it's all happening in my back garden! I'm actually building quite a large frog image archive. I've been shooting them every year since they arrived, but am still missing some shots. I've pretty much covered the frogspawn stage, and the adult stage, and have some fairly cute images of the froglet stage. This year I hope to grab some better images of the tadpoles, especially in the phase where they're developing legs! 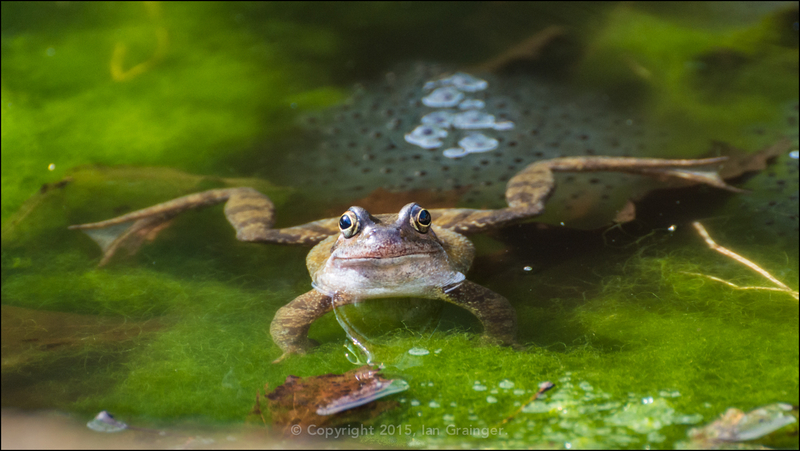 Being underwater beasts, shooting tadpoles has so far proved to be tricky, but I have a plan this year, and if my plan works, and I get some decent images, I'll share my methods here!